Marta Sanders, Photo Credit: Lou MontesanoI am so thrilled to have the opportunity to interview MAC/Bistro Award winning vocalist and top NYC tour guide Marta Sanders about the encore presentation of her show Follow Me. I have known Marta for 15 years and every time we get to do a new interview, I am as giddy as the first time we reconnected! I adore Marta and can't wait to see this show! Follow Me celebrates Marta's twin passions -- New York, and the rest of the world. In addition to her music director John McMahon, Marta performs songs she introduced with her frequent collaborator, the late Michael Greer ("Hunk on the Bus"), she does three tunes by John Wallowitch (including her signature "Warsaw"). Marta's world-class romp around the world also includes tunes by Carol Hall, Sting, and Peter Matz, among others. Debra Zalkind and Mark Nadler are the show’s director. Follow Me will play a four-week engagment at The Laurie Beechman Theatre (407 West 42nd Street, between 9th & 10th Avenue, inside the West Bank Cafe) from February 2-25 on the following dates: Thursday 2/2; Saturday 2/11; Thursday 2/16, and Saturday 2/25, all at 7pm. Click here for tickets! For more on Marta be sure to visit http://www.martanyc.com! 1. This February you are presenting a four-week encore engagement of your newest show Follow Me. What made 2017 the right time to re-do this show? I choose to do my cabaret shows in the winter when the tourism business is quiet here in NYC. I wanted to do the show again, because I got a great response to some changes I made to the format. More storytelling and comedy. 2. What are you looking forward to most about getting back into the show? I'm excited to work the material again. I get to make some edits that I think will make it funnier. It's all about the process, working and reworking. 3. In Follow Me, you are performing "Maria by the River," a song you co-wrote with your music director John McMahon & Debra Zalkind. What do you love about the songwriting process? What do you like most about performing a song you had a part in creating as opposed to a song by someone else? "Maria By The River" is a full character and story. It's not one piece of music. She came through me on my morning walk by the Hudson. I love her because she is a part of me and she is a woman who I know from my travels and my imagination. Every time I bring her to life, she fills me with joy! Marta Sanders, Photo Credit: Lou Montesano4. In Follow Me, you celebrate your twin passions New York and the rest of the world. As a NYC resident, what are your favorite things to do in the city? As a tour guide, what are you favorite NYC sights to show people? I love exploring the City on my own. Going into a neighborhood and just walking around, or getting on a public bus and just riding through neighborhoods and absorbing the different communities. I love taking people through the Village, NOLITA, DUMBO, Hudson Yards, Central Park, St John The Divine, Chelsea, and Bushwick. 5. If you were living in NYC and New York only had five tourist attractions in which you had to live among, which attractions would you choose to live in? Washington Square, Plymouth Church Brooklyn Heights, Riverside Church, Flatiron Building, and The Players Club. 6. What are your top five favorite places you've visited outside NYC? What are your top five dream spots to visit? Favorite Places: Hong Kong, Sydney, Venice, London, & Cape Town. Dream Places: Portugal, Bali, Thailand, Japan, & Istanbul. Marta Sanders7. You will be performing Follow Me in the winter month of February. What do you love most about winter in NYC? I love that it's quieter and we reclaim our city for a minute. I also love the light. 8. If you put out an album of 10 duets, who would you want to sing with? Robert Carlos, Lucicita, Mark Nadler, Eric Michael Gillette, Mercedes Sosa, Delores Hall, Marin Mazie, Chita Rivera, Brian Stokes Mitchell, & Kelli O'Hara. 9. Since this show is called Follow Me, what footsteps of yours do hope people would follow? I believe you can't learn about what the real world is, if you don't travel. Travel is the greatest teacher. It is my passion as is my entertaining. 10. On "Call Me Adam" I have a section called One Percent Better, where through my own fitness commitment, I try to encourage people to improve their own life by one percent every day. What is something in your life that you want to improve by one percent better every day? I'm just trying to slow down. Listen more. In a career spanning several decades, Sanders has won both MAC and Bistro Awards for outstanding female vocalist. Mixing her soaring alto and prowess as a comic storyteller, Marta epitomizes a freewheeling American nightclub style that was prevalent until the ‘70s -- and that has endured with such pros as Bobby Short, Steve Ross, Barbara Cooke and Marilyn Maye. Texas born, and of American father and an Argentinian mother (her father was the head of the Peace Corp in Colombia for a time), Marta grew up in cities across the States and in South America. Soon after arriving in New York, she was cast in the original Broadway production of The Best Little Whorehouse in Texas. But her taste for travel had her gravitating away from the theater to nightclub performing. She was featured in supper-clubs, on cruises and in concert venues across Central and South America, Russia, and on both coasts. In New York she gained a loyal following in regular appearances at such clubs as Les Mouches, The Ballroom, Upstairs at Greene Street, Reno Sweeney, and Grand Finale. She also hosted a radio program on WLIR for a time. In October she combined her twin professions when she offered a uniquely immersive tour of New York’s storied nightlife that included performances and stories by several popular entertainers and cabaret entrepreneurs. Sponsored by Karen Lotman Productions the tour was an official event of the 27th annual Mabel Mercer Foundation Cabaret Convention. 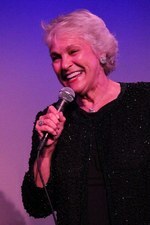 Marta’s recordings include Panache (available on CD Baby), and Corazon del Alma available through www.martanyc.com.